Scott Engel has a genetic disorder that has caused his vision to deteriorate for years. As a member of the Minneapolis Pedestrian Advisory Committee he has been able to shift city policy to prioritize pedestrian needs. Photo by Xiaolu Wang. You are taking a walk around your neighborhood, and then you come upon a busy intersection with four lanes of traffic, lightrail, buses and bikers. And you are a pedestrian. You are at the red light. The lightrail is about to come, cars are passing at the intersection, the walk sign shows you a red hand. Wait, wait. The automatic speaker system warns you to wait. Counting down 5, 4, 3, 2, 1. It’s your turn now. You take a breath, look to your right and left and take a step towards the intersection. There’s a car turning right behind you, waiting for you to pass, you walk a little faster, and you reach the middle of the intersection. The walk signal turns into a red blinking sign, you increase your speed so you can get to the other side. You barely make it to the sidewalk before the light changes. You stop to take another breath. This sounds like a laborious process to go through, yet, most people have been there at some point, most of us have been pedestrians walking, crossing a busy intersection, or traversing the earth on foot. It’s the mode of transportation that the majority of the world uses, yet, we have not been considerate at designing our cities to be safe for walking. According to the Star Tribune, between 2010 and 2014, there were 3,069 crashes with pedestrians in the Twin Cities and its suburbs. Of those crashes, 95 were killed. But pedestrian advocates are stepping up to create new city policies that will improve not only transportation infrastructure, but the very thinking that goes into street design. For the first time, pedestrians and their needs will be put above people in vehicles. Imagine being on foot as your regular commute, day in and day out. And then, imagine crossing a busy intersection while closing your eyes. Imagine what it might be like without knowing the amount of time you have to cross. Imagine you can’t move as fast because of limited abilities. 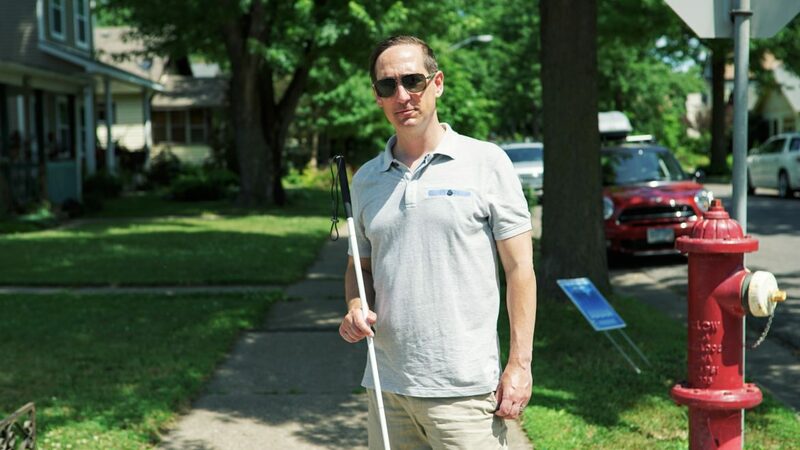 This is a daily reality for Scott Engel, who has Retinitis Pigmentosa (RP), a genetic disorder that affects the retina’s ability to respond to light. Engel’s vision has been deteriorating for about 25 years. But with years of practice, he learned to travel with a cane, read Braille, and other skills. While I was walking with Engel around the neighborhood, he told me that he memorized the layout of Minneapolis. Every street and avenue is mapped out vividly in his mind. While I rely on street signs to orient myself, he does it all in his mind. Scott enjoys traveling to different cities, and feels comfortably walking around by himself in New York City. He confessed, however, that he feels too afraid to cross Hiawatha Avenue. Engel has advocated for more accessible designs for pedestrians for more than five years with the Minneapolis Pedestrian Advisory Committee. To name a few barriers, many pedestrian ramps don’t meet the requirement of Americans with Disabilities Act; the lively cultural corridors like Lake Street and 38th Street have narrow sidewalks, and there are telephone poles in the middle of the sidewalk; crosswalks in the winter are basically out of service because there isn’t allocated resources to proactively clear snow and ice. According to city ordinance, homeowners and property owners are supposed to voluntarily shovel the sidewalk, but it’s a complaint-based process instead of a proactive one. “Cities succeed when it’s walkable.” Engel said. While there is a strong biking culture in the city, Engel advocates for our shared identity as pedestrians. Biking infrastructure has improved noticeably with increased input from passionate cyclists who are involved in city planning. Engel’s hope is to open more conversations around equity and accessibility, bringing more people with different abilities to the table to focus on developing innovative solutions for better experiences as pedestrians. The biggest misconception Engel pointed out is that people think pedestrians and cyclists resent cars. But if we dig deeper, it’s not about cars, it’s about social norms. The problem revolves around the fact that roads are optimized for use by cars, which can give drivers a sense of entitlement to the space. With this system as the norm, there’s a disappointing lack of consideration for other users of the street besides drivers. What about the safety of children, elderly people, people with disabilities, and low income people who can’t afford cars? When the roads are designed to be wide without bike lanes and crosswalks, it is a signal to drivers that they can take up most of the space, pushing out other users of the street. “All people [should] have the opportunity to get around regardless of the modes they are choosing.” Matthew Dyrdahl, the bicycle and pedestrian coordinator from the city of Minneapolis said on the phone. When people feel trapped and disempowered by the ways of getting around, a lack of choices for navigation seriously impacts quality of life. “The goal is to make walking and biking a legitimate option.” Dyrdahl said. There is a large population who want to walk and bike more but don’t feel that there’s a safe infrastructure around it, the city is trying to make the choice to walk and bike easier and more convenient for people. On May 27, the Minneapolis City Council approved the Complete Streets policy, which has been gaining momentum in city governments across the state. The policy reverses the hierarchy of old street design, recognizing the needs of pedestrians first, then cyclists and transit riders, and finally, drivers. The policy advocates for improvements such as raised medians to protects pedestrians, narrower lanes and on-street parking to slow down traffic and clear well marked signage and crosswalks among many other improvements that affect all modes of transportation. “There seems to be a nation-wide shift from the automobile to making a choice for other means that is not automobile.” said Steve Mosing, Minneapolis’ traffic operations engineer. This shift comes from concerns with our state of health and the state of the environment. One of Engel’s colleague on the committee, Julia Curran, walks with her 95-year-old father, Tank, on a daily basis. Their journeys are an empowering example of how people are taking enjoyment and ownership of walking. Her father has a Twitter account @capandcane, documenting his adventures while walking through the city. They walk on average one and a half miles regularly. The furthest they tracked together is seven miles during May Day Parade. Curran said over a phone interview that “walking is traffic, walking is transportation.” People who are on foot don’t just take walks for leisure, they also have places to be. Some people have the privilege to not own a car as a lifestyle, some people simply don’t have a choice, Curran said. Great article! Highlights important changes our city is (hopefully) making. Great information. Thanks for bringing it to our attention. I agree that our car culture often excludes pedestrians. And Hiawatha is impossible. I saw a family with a stroller crossing and they barely made it across. Now we just need to get the Public Works department to follow the official city policy. Based on one recent proposal, they are not. Great article. I am so glad to see you concern ordinary people’s life from detail. A lot of people may even not think about it or get used to it, but you certainly not only think about it but also take an action, advocate for them, try to improve people’s, specially for those people – pedestrian who need equal chance to enjoy their life. I’ve heard that in some other countries, city crews are responsible for keeping sidewalks clear in the winter. Several times in Minneapolis, I’ve seen women struggling to push carriages through sidewalks that have not been shoveled. This is in many ways a great city, but it would be so much greater if everyone could walk comfortably wherever they needed to, no matter what season it was. Great article. Especially about cleaning if sidewalks in WI terms. My mom fell once and no onewas around to help her as she slipped on ice and not cleared snow. But then there is a sad catch to this also elderly living in their homes are trapped in winter and need help with snow cleaning so if there is an organization that helps low income seniors still living in their homes please let me know. Another thing snow plow trucks sometimes block off corners of sidewalks so pedestrians can’t cross streets. Pains of winter. Thanks for the article way to bring to light something that benefits pedestrians. Thank you for writing this. Finally there are people who are thinking of pedestrians. For so long, and still today, the Twin Cities have been cities for automovilrs, not pedeztrians. Now they are becoming more bicycle friendly, but a long way coming to be walker friendly. Today I almost got run over by a bike riding on the sidewalk coming towards me. And I can’t count the times drivers, looking the other way, almost drove over me as I crossed on green and the driver wanted to turn. I physically had to stop one of these! Awful! The attorneys of Mohamed Noor, the police officer who shot and killed Justine Damond in 2017, have filed to dismiss the charges against Noor on the grounds of prosecutorial misconduct and a failure to demonstrate probable cause. The attorneys suggest that statements made by county attorney Mike Freeman undermined Noor’s right to a fair trial.